Visit 5 Waterfalls, Butterfly & Hummingbird Gardens, Plus a Volcano! 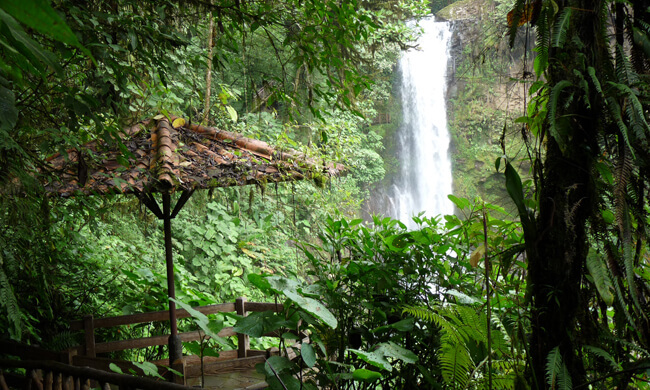 This tour is perfect for nature lovers as you’ll visit some of Costa Rica’s natural wonders. You will be picked up from your hotel in Jaco and driven through rolling hills and small towns until you reach Poas Volcano. The Poás Volcano is a majestic natural titan with a crater over 1.5 kilometers wide. At the top you can see the volcanic activity from a safe distance, and take in the beautiful vistas that surround the area. Afterwards you head up towards the volcano where you will take a short walk to the crater. Enjoy the beautiful plants and vegetation that lead you to the heart of Poás. Next up, one of the most treasured private nature reserves in Costa Rica. La Paz Waterfall Gardens is home to five waterfalls, cloud forest and rainforest, orchid exhibit, hiking trails, aviary with numerous species of birds, insect exhibit, butterfly garden, hummingbird garden with 26 documented species, and animals such as capuchin (white-faced) monkeys, black-handed spider monkeys, jaguars, pumas, ocelots, frogs, and snakes. A favorite is the butterfly garden. There you will see beautiful butterflies fly over lush vegetation and colorful flowers, and afterwards you can head to the hummingbird gardens where the tiny marvels of nature hover next to you. This is essentially a self-guided tour and you can decide how much time you want to spend in each area. You’re going to need quite a while to get the hummingbirds to pose for your pictures! Features: 3.5 kilometers of gardens and beautiful vistas. The tour includes a delicious Costa Rican lunch as well as transportation. Make sure to bring a light jacket given that the altitude might make the weather chillier as the day ends.